William Williamson, 1922; sculptor Alexander Carrick, Edinburgh. World War I memorial of plinth and group soldier statue with World War II roll-of-honour added. Polished ashlar. 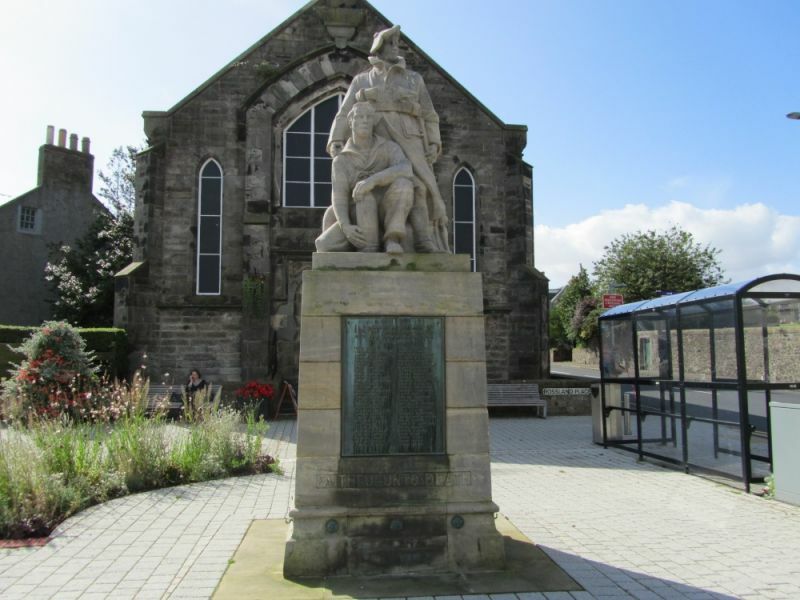 Monumental square-section, single stage plinth with roll-moulded band course at base and stepped coping stone giving way to pedestrian figure of Black Watch soldier and kneeling naval rating, with shell cases behind. NE ELEVATION: incised stone close to base, 'FAITHFUL UNTO DEATH' giving way to inset bronze plaque with WWI roll-of-honour. The memorial is built on the site of the Toll House, and was unveiled by Sir Ralph Anstruther, Lord Lieutenant of the county, in September 1922.